But GA is capable of much more than counting the number of pageviews and visitors you’re getting. GA can seem like a bewildering place for the uninitiated, especially if you’re not a numbers person (and I’m certainly not). So it makes sense to concentrate on the stats you care about most by setting up a custom dashboard. This allows you to drill straight down to the information you want to see is readily available at a single click. While the default dashboard is perfectly adequate for many businesses’ needs, it is geared towards top level audience stats, which may not necessarily be your focus of interest. You may find it useful to set up a number of custom dashboards to cover your brand’s various objectives. For example, you could set up different views to track paid search (PPC), organic search (SEO), social media etc. Make sure your own activity on the site doesn’t appear in the results by setting up a filter to exclude by IP (your IP address can be obtained by Googling “my IP”). You can do the same to exclude admins, testers or anyone else who might skew the data. To track whether your strategy is working and visitors are taking the actions you want them to, for example, conversion rates for ads, form completions, purchases, etc, you need to tell GA what your goals are. 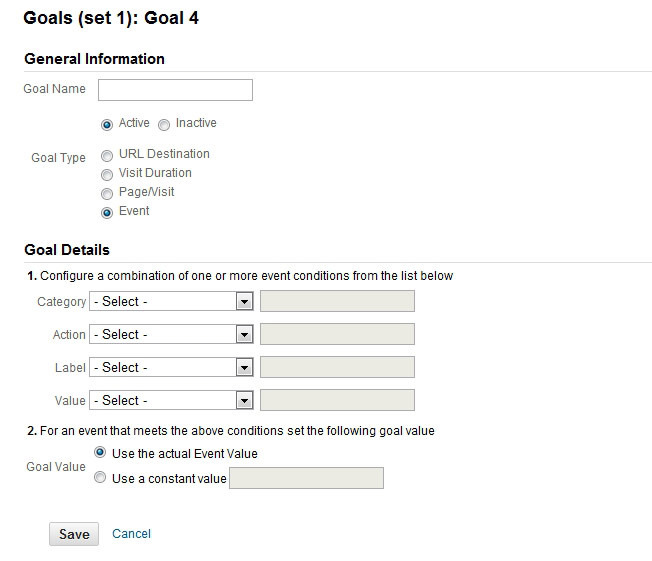 Goals allow you to track the actions that are most important to your business, for example, conversion rates for ads, form completions, sales etc. Without them, you’re bascially shooting in the dark with your marketing activity. Pages/Screens per session: the user views a specified minimum number of pages or screens. This Kissmetrics blog is an excellent resource to learn the basics about setting up and using Goals. Content is a big deal when it comes to optimising your search engine visibility, differentiating your business and engaging with your audience. But it’s also labour and time-intensive to produce and leverage effectively. This makes it vital to keep tabs on what works (so you can do more of it) and what doesn’t (so you can tweak your approach, or ditch it altogether). For more info, see our blog Analytics and content marketing – what to look for and where. Your SEO and/or PPC strategies are working: you’re getting visitors to your site. But what are they doing when they get there? As well as using GA to track what pages people visit on your site, you can also look at the terms they’re searching for, which gives you a very detailed insight into their intent, in their own words. To monitor what visitors are typing into the search box on your website, set up site search in GA. Here’s how to set it up. Referrer spam can skew your figures and artificially inflate your bounce rate. This is a technique where spam-bots hijack your analytics account to send repeated HTTP requests with a false referrer URL, drawing attention and traffic to the spammer’s site. This is makes the figures unreliable for tracking your performance, and can have a negative effect on your your SEO ranking. Find out how to remove referrer spam once and for all. Our SEO Toolkit contains a wealth of resources to help you to monitor and optimise your organic search (SEO) activity. Download it today!